This beautiful farm house captures your attention with its mixture of stone and lap siding along with the large and welcoming front porch. 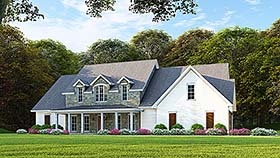 As you enter the home you will find yourself in the foyer that leads you to the dining room to your right or into the spacious great room straight ahead. The open floor plan allows the great room and kitchen to flow together seamlessly so you never miss a thing while cooking up dinner. On the left side of the home are bedrooms 2 and 3 which share a hall bath and bedroom 4 with its own private bath. Privately tucked away in the back right corner of the home is the large master suite complete with a huge double vanity, whirl pool tub, separate shower and walk-in closet. Heading upstairs you'll find bedrooms 5 and 6, a full bath and sitting area.